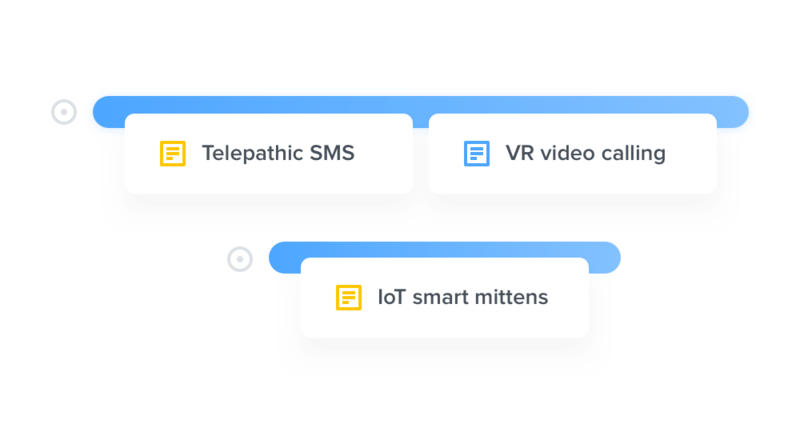 Use the Insights board to consolidate user research, feature requests, and user feedback streaming in from a number of sources. Spot trends and identify patterns that will help you prioritize what to build next and build it in the right way. 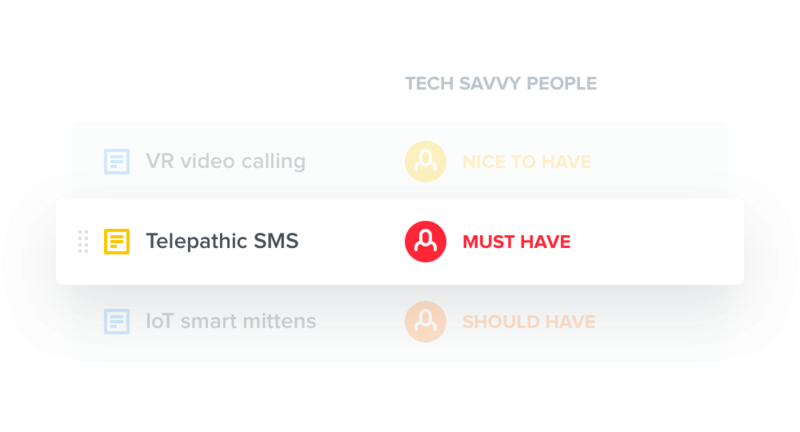 Highlight interesting insights in user research & feedback and link them to related feature ideas. For each feature, see everyone who’s ever requested it and exactly what they said. Outline feature ideas according to the user needs they address, or switch to a flat list view to sort them by priority. Maintain peace of mind with a manageable product backlog. Define the strategic criteria you’ll use to make prioritization decisions. Visualize how features support key product & company objectives and watch the most promising features rise to the top. Calculate a custom weighted score for each feature based on how well it aligns with strategic drivers. Sort and filter features to surface the most promising ideas. The most effective product teams set clear objectives to ensure their work advances specific outcomes. Use objectives to prioritize features that align with your strategy. Then group your roadmap by objective to communicate the rationale behind every feature you're working on. Visualize the value/effort tradeoff of each feature idea on the interactive Prioritization matrix. Drag and drop features to adjust their position. Then decide on a final priority (must-have, should-have, or nice-to-have) and add them to an upcoming release. 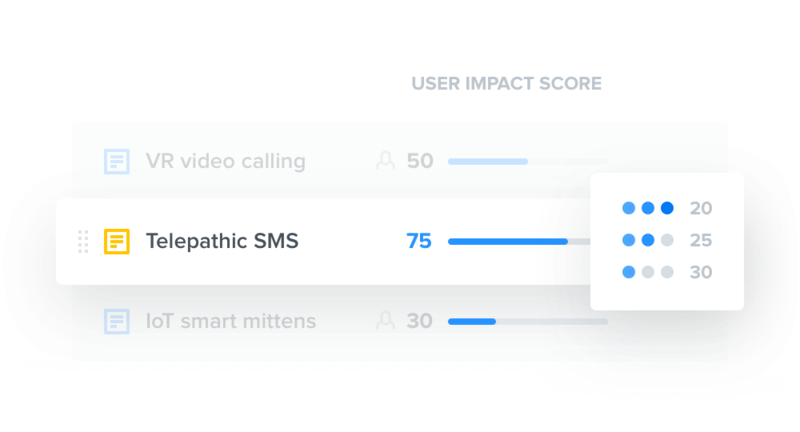 Auto-generate a score for each feature that indicates how well it meets the needs of your users, based on the user insights you’ve categorized on the Insights board. Zero in on features users have requested lately. Publish a selection of your ideas to your public Portal to collect upvotes and user feedback. Source new ideas and uncover user insights you might have missed. 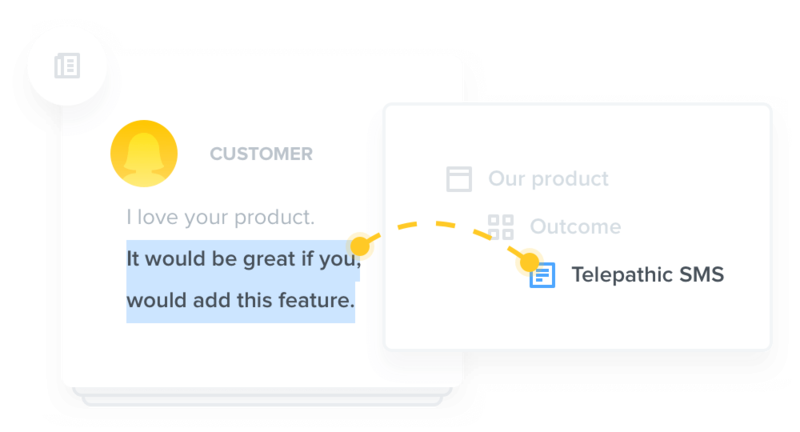 Track the status of tasks that are common to many features, like designs, mock-ups, marketing collateral, or documentation. Ensure nothing falls through the cracks as your launch date approaches. Trying to please everyone means pleasing no one. 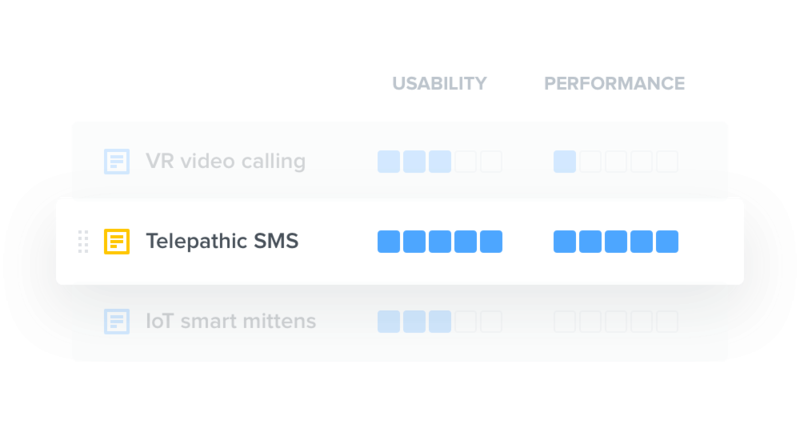 Keep track of which features meet the needs of which market segments (like SMB vs. enterprise) or user segment, roles, or personas (like business user vs. technical user). 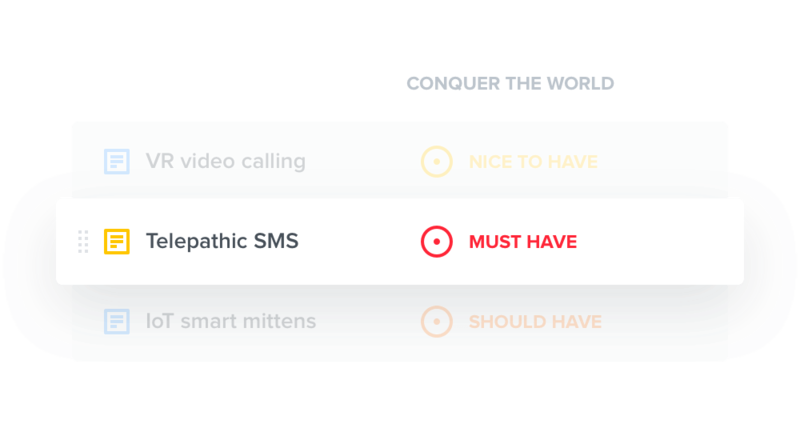 Score features based on how well they will help you compete with other players in your space. 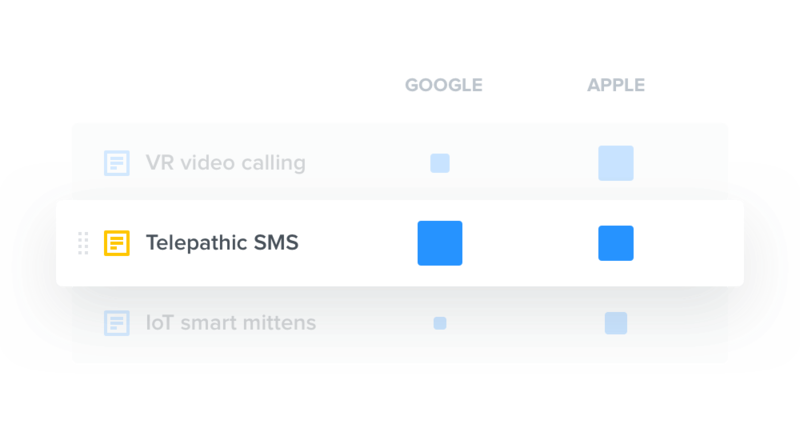 Filter by competitor to prioritize features most likely to attract and retain users who are at-risk of adopting another solution. Ground your ideas in reality by tracking the complexity involved in bringing them to life. Incorporate effort into each feature’s Prioritization score. As you prioritize what to build next, add them to an upcoming release. Then fine-tune your release plans on your Features board, or directly on the Roadmap. 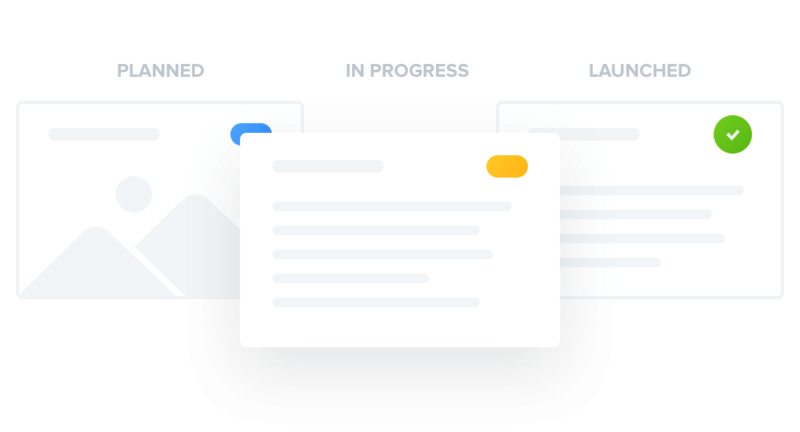 Track feature progress from ideation through delivery in a special view for teams that practice Kanban, continuous delivery, or dual-track Agile. 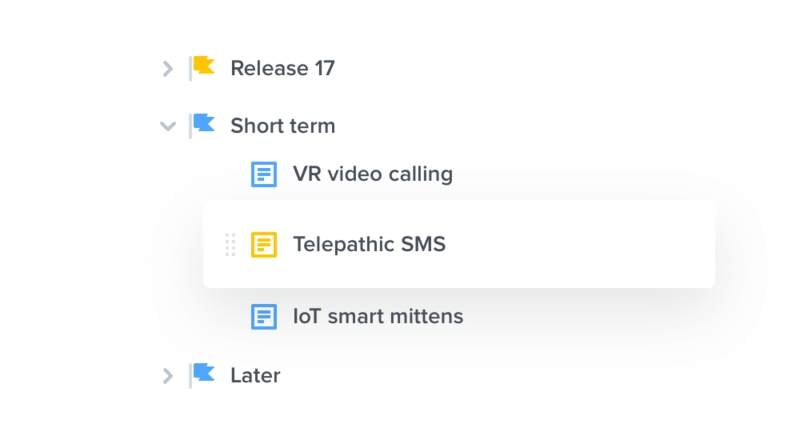 Customize the stages each feature moves through to match your team’s workflow. 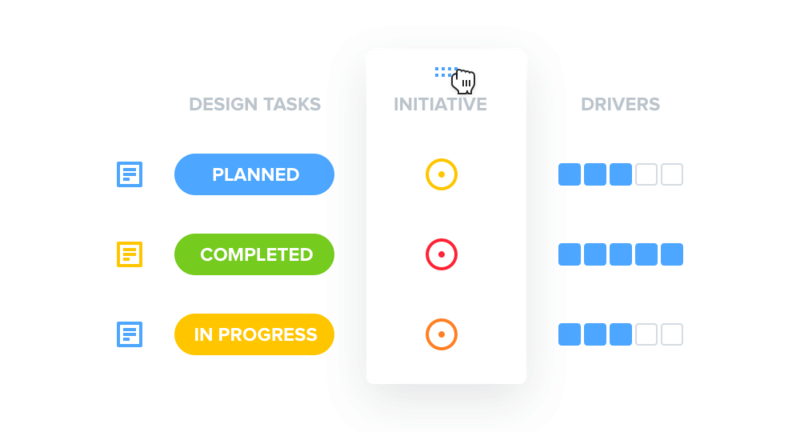 Share your roadmap with colleagues and invite them to see criteria that went into your prioritization decisions – even the original user feedback that inspired each feature in the first place. Export your roadmap to PDF to share it with others outside your organization. Share what you’re working on now, next, and later on a public Portal to engage your customer community. 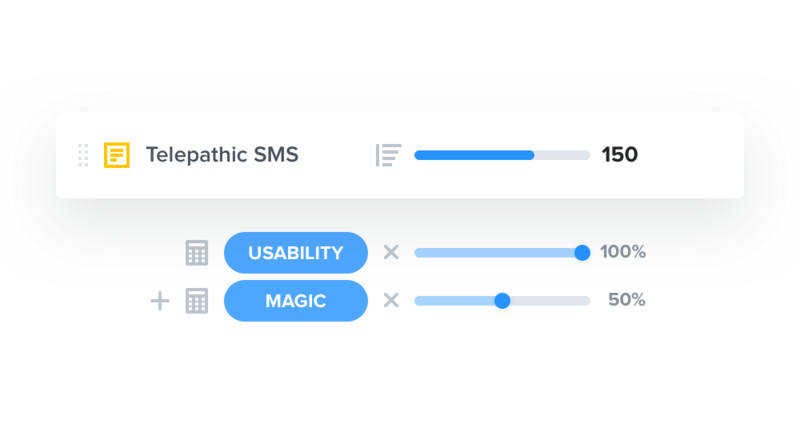 Celebrate what’s been launched to help users get the most out of your product. 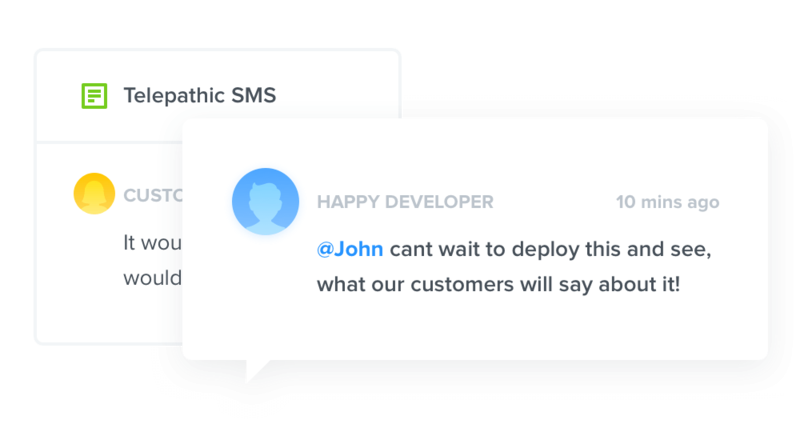 Consolidate feedback spanning sources like Slack, Intercom, Zendesk, email, and hundreds of other apps via Zapier. Use the productboard extension for Chrome to gather user insights from customer-facing colleagues across your organization. Preserve engineering workflows by integrating productboard with development planning tools like Jira, Trello, GitHub, and Pivotal Tracker. @mention colleagues in a comment to start a discussion about a piece of user feedback or a feature idea. Share context with colleagues to earn their trust. 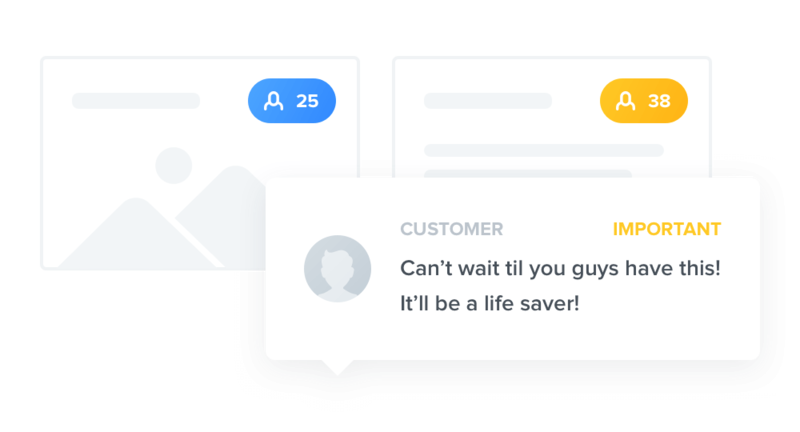 Get alerts when important user feedback arrives or new features are created that relate to your product. productboard contains a series of customizable boards that help you manage the information required for making decisions during each stage of the product management process: understanding user needs, capturing ideas, prioritizing features, planning what to build when, sharing the roadmap, and monitoring each feature’s progress toward delivery. 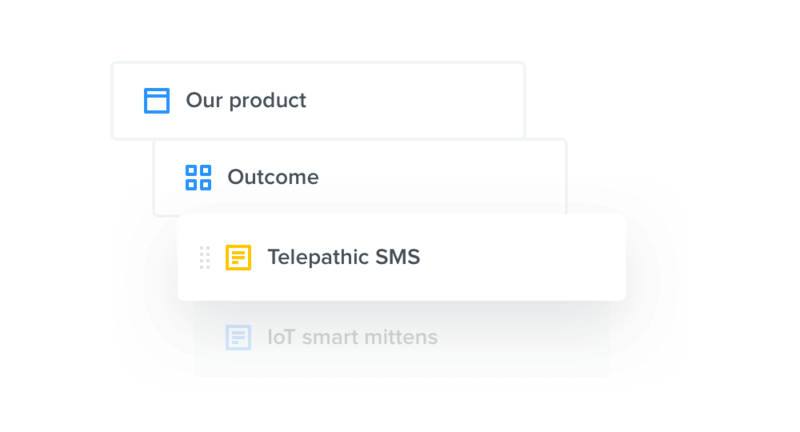 Use productboard’s intuitive drag-n-drop interface to reconfigure your boards to match your team’s needs. Ready to make excellent products?